The big news from yesterday was all JetBlue TrueBlue members can now earn 3 TrueBlue points per dollar spent at Amazon when using a special, unique link in your TrueBlue profile or when shopping on Amazon while inflight on JetBlue using their Fly-Fi Wifi network. There appears to be no end date listed for this promotion nor any cap on the amount of points to be earned. The best part about this promotion is that is covers most Amazon purchases and in my personal Amazon shopping, it covers 100% of my purchases. Direct Link to Bookmark to Access This Promotion. Here are the excluded categories of which none seem to be of any major consequence. This is a pretty big deal as this promotion has very few restrictions on what is not eligible, unlike many of the shopping portals out there. For example, TopCashBack (yes, this is my referral link in which we both earn $10) only offers cashback on Jewelry, Patio Lawn & Garden, Watches, Clothing, Amazon Home Services and Amazon Prime (though at a much higher percentage from 8.5% to 10% – so if shopping in those categories, use TopCashBack or other shopping portals). But now for those everyday purchases of soap and toilet paper, you can earn 3 additional points without having to worry about category restrictions. Anyway going back to the title of this post, with the promotion I can now earn 8 miles/points per dollar spent on my Amazon purchases. Currently, I use my Chase Ink Bold business card to buy Amazon gift cards at Staples to take advantage of the 5x bonus category at Office Supply stores. I’ve been doing this for years so I’ve always earned 5 Chase UR points per dollar spent at Amazon though at the trade off of price protection and extended warranties offered through my credit cards. Now factoring in 3 TrueBlue points per dollar spent, I’m up to 8 total miles/points earned for every dollar spent at Amazon. For others trying to replicate this, even if you don’t have access to a Chase Ink card due to not having a business or you are subject to the 5/24 rule, the Discover It cards offer 5% back this quarter at Amazon while historically the Chase Freedom has as well though not in this past calendar year. Another option would be the Amex Blue Cash Everyday card which offers 10% back on Amazon purchases though only for the 6 months of card membership. Using a fair value of 1.4 cents per TrueBlue point, your potential return on Amazon purchases could be 14.2% for the first 6 months of Amex Blue Cash Everyday card membership. Not too shabby! If you shop often at Amazon and buy many of your household goods from them (guilty), then this is an easy way to get an extra 3 points per spent dollar spent ON TOP of existing credit card rewards (in my case 5 Chase UR points per dollar spent). As mentioned above, shopping portals only offer a limited range of categories to earn cashback but with this promotion, you can basically buy almost anything on Amazon & earn an extra 3 TrueBlue points per dollar spent. I’m loving this promotion as I was going to make these “everyday” purchases anyway and now I can earn an extra several thousand points a year on my Amazon purchases just for clicking my unique link before I shop. With the amount I spend at Amazon yearly, there is no doubt I’ll earn a free flight (even if it is just a one way) with this promo so its well worth the few extra mouse clicks before shopping at Amazon. Kudos to JetBlue and Amazon for this exciting new promotion! JetBlue 25% Off Award Flight Promotion: 7,700 Points for a Roundtrip to the Caribbean! 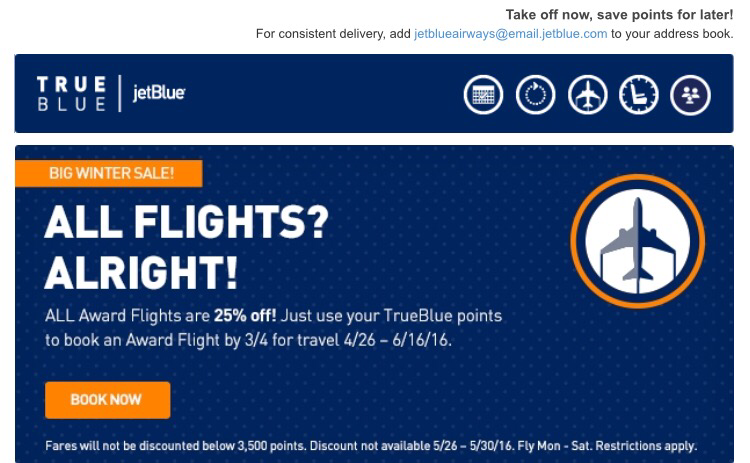 It has been a while but JetBlue is having an award sale once again on flights with 25% off most award flights. It is actually a solid promotion as I’ve found roundtrip flights to the Caribbean for as low as 7,700 points! For this promotion, the travel period is almost two months long from 4/26 to 6/16, there are no restrictions on destinations and only Sundays & dates around Memorial Day are excluded. Flights must be booked by 3/4 to lock in the 25% off. 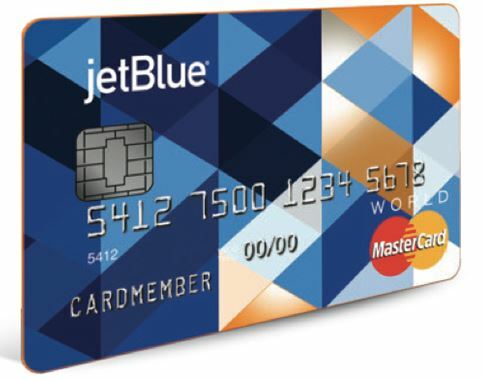 Flights won’t be discounted less than 3,500 points and while I normally don’t advocate transferring American Express Membership Rewards points over to JetBlue, it might make sense in this case to top off your account for a discounted award flight. I spent a few minutes poplin around for deals and as mentioned above I see some great flights available from NY to the Caribbean for as low as 7,700 points roundtrip for non-stop flights! 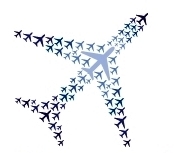 I also see 7,000 points flights on to many US destinations. These amounts are literally less than half of any roundtrip Avios award flight as those start at 15,000 Avios now. I think there are some great deals to be had with this promotion – share your findings in the comments!